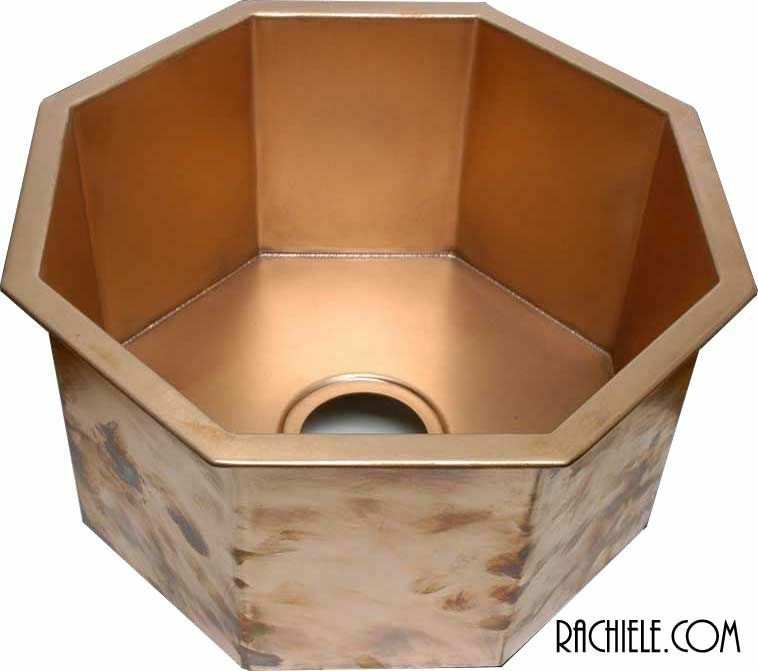 Copper Sinks: Copper pedestal sinks, copper wall hung sinks and more. 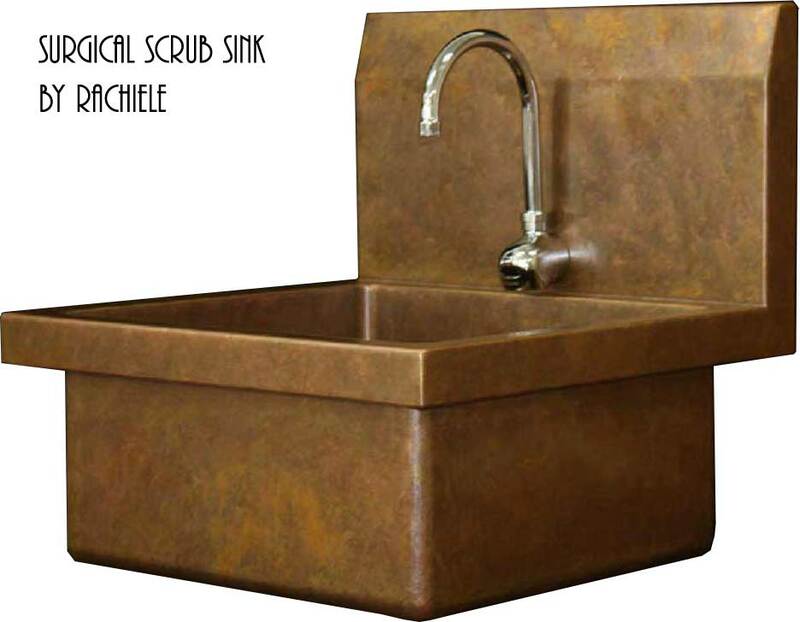 Unique, Beautiful, Functional... Rachiele sinks are	Unique	I hope you will consider joining our family of custom sink owners. I look forward to working with you. All kidding aside... Be unique. Have fun. Don't worry. 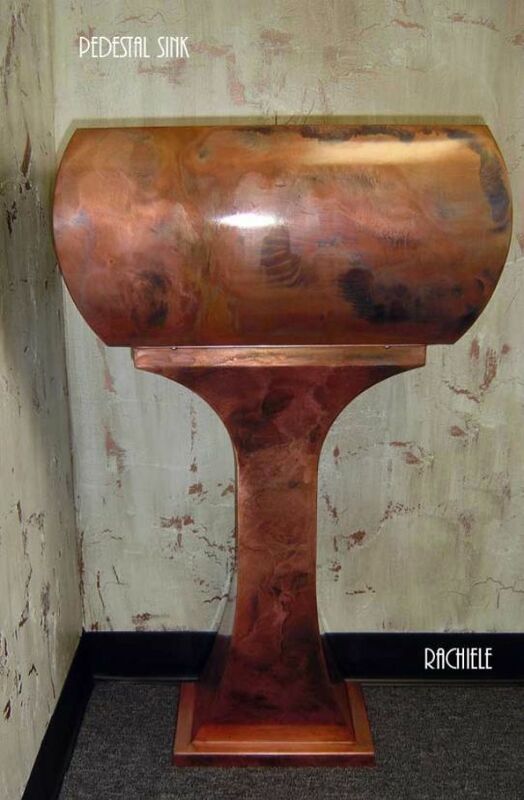 Copper Pedestal sinks, and other unique designs. This is a unique "Heart Shaped" lavatory sink. Radius apron front sink was custom made to fit the fine cabinetry of Quality Custom Cabinetry for the 2005 Kitchen and Bath Show in Las Vegas. Quality Custom Cabinetry could have selected many other sinks for their display. In fact, most every other manufacturer would have offered their sinks at no charge just to have their product in the National Kitchen and Bath show. 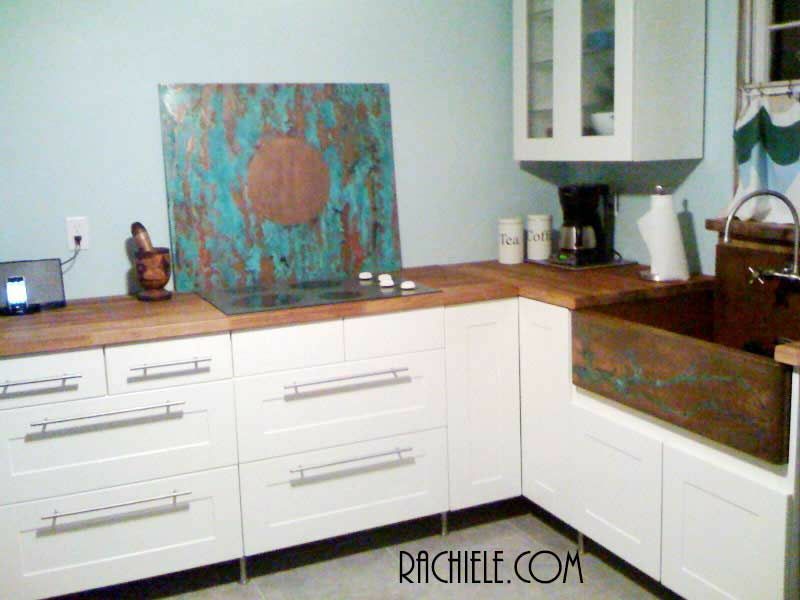 Quality Custom Cabinetry by passed their free options and paid for a Rachiele sink because they wanted to show a quality that was representative of the fine quality craftsmanship of their cabinetry. 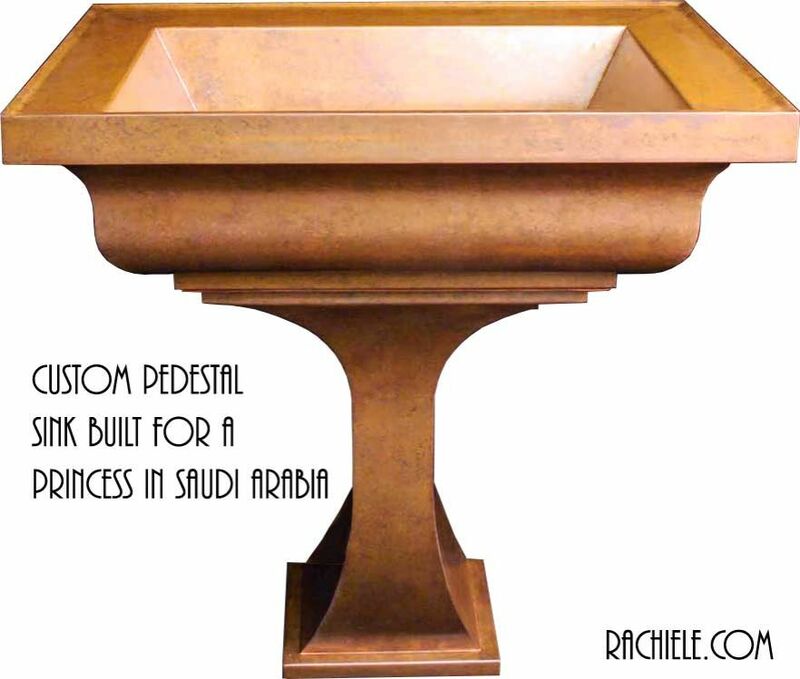 This is a copper pedestal sink that we custom designed and manufactured for a Princess in Saudi Arabia back in 2003. The sink is 60" wide and was designed to be mounted on the wall with the use of a specially designed mounting bracket. 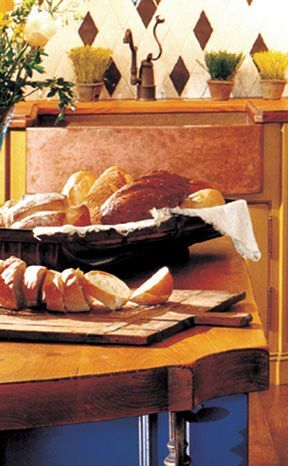 This sink has our Rustic patina. This is a copper surgical scrub sink for Tulane Lakeside Hospital in Louisiana. Octagon shaped top mount copper sink prior to patina. Pedestal sink with fire and ice patina. I did the patina myself, likely around 2003 or so. Lori does a much better job than I. Copper retrofit farm sink with drainboards designed to take the place of an existing sink with damaged countertops. This is a photo of Melissa's kitchen. As you can see she has used copper with contemporary white cabinetry. She has also had a custom patina made on the copper back splash behind her cook top. 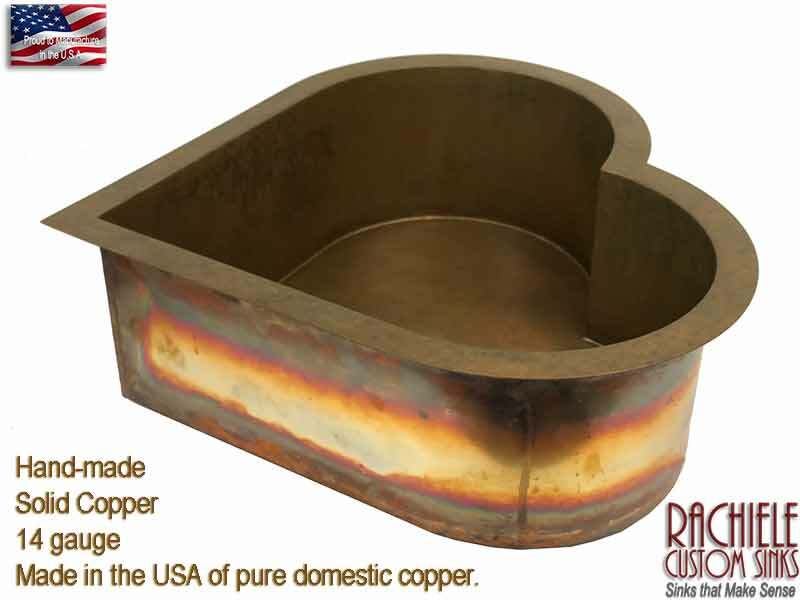 We can build Your unique copper sink now Shop Now!